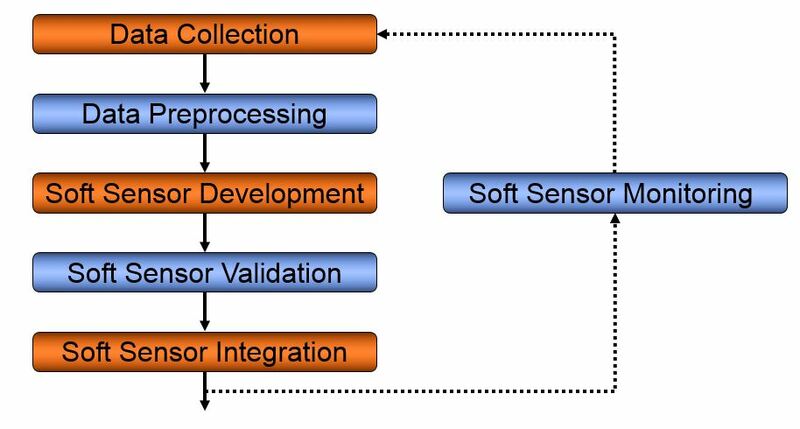 Soft sensors, also known as virtual sensors, surrogate sensors or proxy sensors, are computer models that calculate estimates of physical sensor measurements or lab measurements, based on other variables that can be more easily and/or more frequently measured. When is it a good idea to use soft sensing? Are some of the physical sensors in your production process (sometimes) unreliable? Do you need to make frequently expensive and/or time consuming lab measurements? Does it take long before you can evaluate certain quality aspects of the produced products, leading to a too high fraction of second-quality production? Do you need to put production on hold while maintaining or fixing certain expensive physical sensors? Do you want to have a continuous estimation of a quantity for which no (affordable) physical sensors exist? In all these cases, virtual sensing may be the right solution for you. In such circumstances our soft sensor projects typically have short earn-back times, often shorter than a year. Soft sensor development and integration requires skilled professionals supported by powerful tools. That is why we offer soft sensor development as a service to our customers. That is also why we have created the YASENSE product family to make that service efficient and effective. process inputs: input flows to the production process like raw material properties and volume, as well as process characteristics like pressure, speed, temperature etc. measurements. process outputs that are more easily measured like certain product properties. The process outputs are easier to measure on-line are often called secondary process outputs, wheres the hard to measure process outputs of interest are called the primary process outputs. In a soft sensor development project, we can build so called "white box" models, as well as "black box" models or a mixture of the two (non-surprisingly called "grey box" models). In white box modelling, the model is created based on a physical/chemical understanding of the process and the translation of that in mathematical formulas that are calculated by the computer. 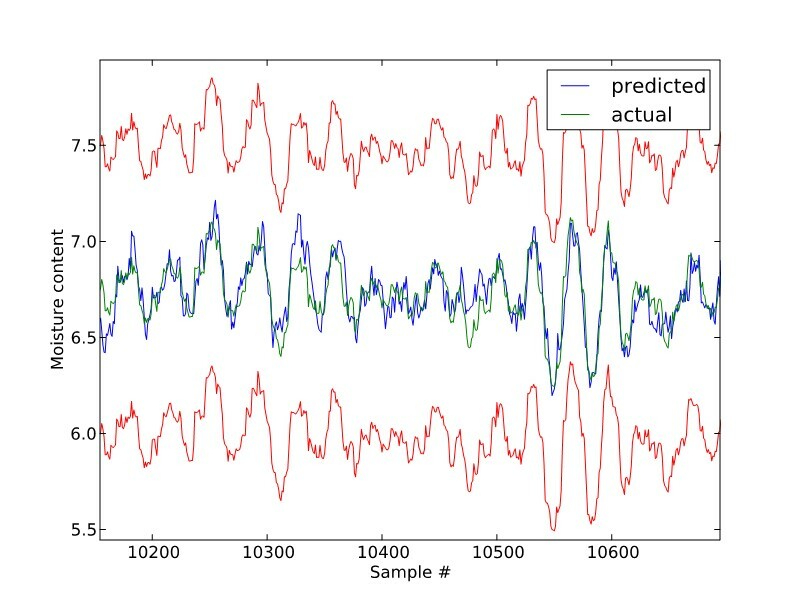 In black box modelling on the other hand, our machine learning algorithms learn the model from historical data. We always need some historical data, even in the case of white box modelling: at the very least to evaluate the performance of the soft sensor. A project to create a soft sensor and integrate it into a production management system or into a process control system follows a number of typical steps as illustrated in the figure. Because a production process evolves over time, it can start to behave differently than at the time the original soft sensor was created. This is the reason why we recommend to deploy our YASENSE soft sensor monitoring tool that will continuously observe the performance of the soft sensor and the characteristics of its inputs, and will produce a configurable alert if something appears to go wrong. The moisture content of paper produced in a paper machine is a very important product characteristic that has to lie within well defined band. The moisture content is measured by a measurement device (typically based on infrared measurements) that scans back and forth over the produced paper. It is a well known issue that in the first few minutes after start-up of the machine, that scanner produces unreliable measurements. A typical reason for that is water that has condensed on the device during stand-still. Despite all efforts to fix that issue mechanically/physically, it is still an often occurring problem in pulp and paper industry. Our solution has been to create a soft sensor that has learned the relation between tens of on-line measured paper and machine characteristics (speeds, steam pressures,...), and the moisture content when measured by a well functioning scanner (in regime operation). Now, in the first few minutes after start-up, the steam to dry the paper is controlled based on the moisture estimate of our soft sensor, instead of based on the physical moisture scanner, resulting in less second-quality paper. A figure illustrating the accuracy of the moisture estimate made by our soft sensor ("predicted"). The line "actual" shows the moisture measurement by the physical moisture scanner. This plot is taken during regime operation, when the physical moisture scanner is known to produce accurate measurements.